Winter may not bring snow to the San Francisco Bay Area, but it definitely brings waterfalls. 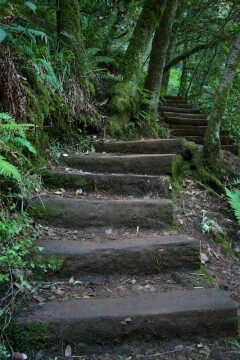 If you find time before spring, head to Cataract Creek Trail in Marin County. The drive alone delivers stunning views of Mount Tamalpais State Park and the trail has some of the most beautiful waterfalls along the West Coast. Located in the thick of redwoods, oaks and ferns, the roaring waterfalls can be heard from quite a distance. These falls are more impressive after heavy rain, but still quite lovely at a gradual flow. Moss and lichen are everywhere, and it is not uncommon to see banana slugs along the trail. There are at least 7 distinct waterfalls to see on this hike, which make it the photographer’s ideal day trip. One thing’s for sure though- it’s a steep slope, and sometimes it’s a little slippery. To see water falling, you’ve got to climb up, and the higher you go, the more rewarding the view. This gorgeous trek is recommended for moderate hikers; dogs on leashes are allowed. During the rainy season, Cataract Creek Trail’s waterfalls flow into Alpine Lake Reservior, one of five reservoirs located on the Mount Tamalpais Watershed. These reserviors are managed by the Marin Municipal Water District and supply water to southern and central Marin. If you still have energy after the hike, walking over the dam is an easy stroll before hopping back into the car. With less than two months left of winter, the days for Cataract Creek Trail’s waterfalls are limited until next year. In the spring, the falls will become a mere trickle and wild flowers will began emerging. Although it’s not spring just yet, wildlife in Mount Tamalpais State Park is quite active right now, with gray foxes, coyotes, red-tailed hawks, American kestrels, turkey vultures, and more, out and about daily. 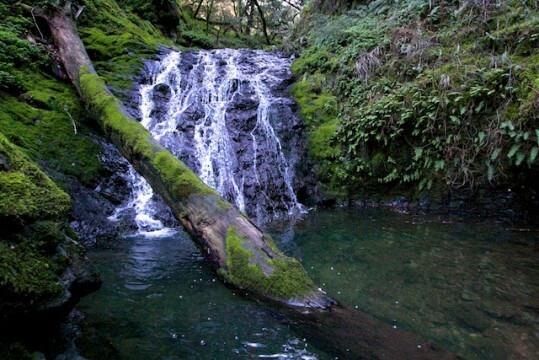 In addition to Cataract Creek Trial, other waterfall trails to see in the Bay Area before the season is over include Uvas Canyon County Park and Murietta Falls. Waterfalls are definitely an experience, so grab your hiking boots! Rachael is an Animal Keeper and blogger at CuriOdyssey with over 15 years of experience working with wildlife. She volunteers at The Marine Mammal Center, is President of the Bay Area chapter for the American Association of Zookeepers (AAZK), and is a member of AAZK's Communication Committee and Professional Development Committee. Rachael earned her B.A. in Environmental Sustainability and Social Justice from San Francisco State University.